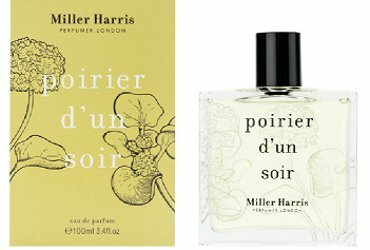 British niche line Miller Harris celebrates their 15th anniversary this year with a new fragrance trio: Cassis en Feuille, Coeur de Jardin and Poirier d'un Soir. Cassis en Feuille ~ with bergamot, blackcurrant bud, tomato leaf, geranium, rose, cedar and musk. Coeur de Jardin ~ with bergamot, lemon, pear, peach, rose, jasmine, tuberose, orris, amber, musk, moss and patchouli. Poirier d'un Soir (shown) ~ with bergamot, pear, dark rum, blackcurrant, marigold, caramelized sugar, rose, spices, peony, birch tar, ambrette seed, white cedar and cashmere wood. Miller Harris Cassis en Feuille, Coeur de Jardin and Poirier d'un Soir will be available in 50 and 100 ml Eau de Parfum, and will debut in March. They aren’t as widely stocked here as they once were. I’m curious – there needs to be a revolution in new crisp florals – maybe these will be very nice. I’m really satisfied with what’s been done the past few years with milky florals and powdery florals. But crisp florals that aren’t just edc or fruit salad aren’t that common. My Cristalle wants some company. Oh, I know what you mean. Modern crisp is not the same as old school crisp…I think all the newer synthetics are too smooth.